Want to stop drowning in your stuff? 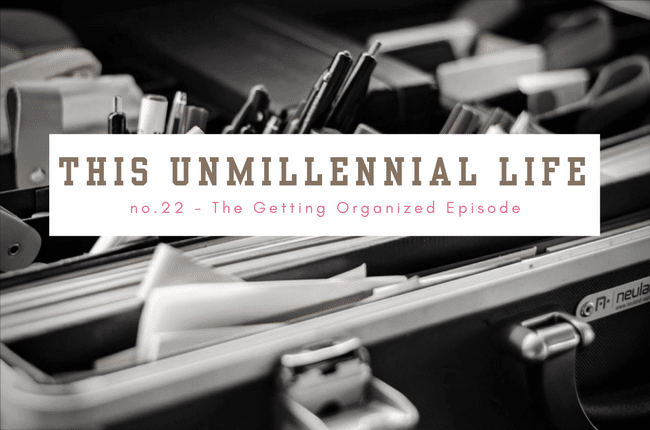 Find out how to get organized! A digital society with no mail and no clutter may be the stuff millennials dream of. But the reality for many unmillennials is we’re still drowning in a sea of our own stuff. Having spent years accumulating the day-to-day goods that make up a 40- to 50-something life, GenXers now find themselves at a crossroads of wanting more order while living an otherwise unordered life. To close out the show, I’m sharing a detailed recap of how I managed to avoid jetlag and get a good night’s sleep on the plane overnight on a recent work-related trip to Europe. And I wrap up the show with a fun little voice mail message from Pamela, a fan of the show. If you’ve been listening to the show for a while or are a new listener and have thoughts about what you like/don’t like, I’d love for you to share them with me through this very brief LISTENER SURVEY. Thanks for your feedback! And as always, you can either Tweet Me @ReganJonesRD, leave me a voicemail, join the This Unmillennial Life Facebook Group OR submit a show idea here! Thank you for listening and sharing with a friend! Just this last week a listener shared with me that this podcast feels like a chat between friends. Please tell a friend about the podcast so she can listen in, too! Thanks for subscribing. If you enjoy the show, please leave a review! This week’s episode is sponsored by HealthyAperture.com — the web’s first and only dietitian-curated recipe discovery site.